The starting eleven that Basena has kept faith in for tonight’s game against Egypt. Courtesy photo. 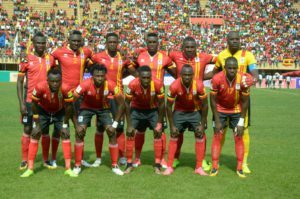 Uganda Cranes coach Moses Basena has kept faith with the same starting line up that beat Egypt in Kampala five days ago for the all or nothing date with the Pharaohs tonight. Captain and goalkeeper Dennis Onyango will again lead the group in goal with Nicholas Wadada Murushid Jjuko, Isaac Isinde and Godfrey Walusimbi infront of him. Hassan Wasswa Mawanda and Khalid Aucho will anchor the midfield as the trio of Farooq Miya, Joseph Ochaya and Thursday’s goal hero Emmanuel Okwi play behind Derrick Nsibambi like it was last time out. Although Kizito Luwaga got some playing time on Thursday after arriving late to join up with the rest of the squad, he retains his place on the substitutes bench along side veteran striker Geofry Sserunkuma. Uganda will take on the might of Egypt at the Borg El-Arab Stadium in Alexandria tonight in a game that neither side can afford to loose. The Cranes are top of group E with seven points, Egypt second on six with Ghana who are currently playing Congo Brazzavile third with only two points from the previous three outings. Goal hero Emmanuel Okwi (left) regains his starting slot for tonight’s clash.